The game has come a long way since that initial roster. There’s no denying that Riot has come a long way since their original forty champions. 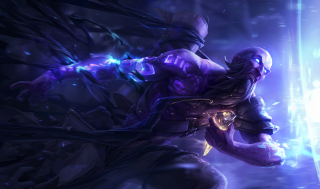 While there have been countless hiccups along the way from launch to today, including horrors like release Xin Zhao, the multiple Ryze reworks, and a few artistic fumbles, Riot has grown creatively. The process of making a champion, which lasts for months on end, is fascinating to explore. While Riot is often critiqued for having many arms, each carrying out their own task, and little communication between those departments, this falls away when it comes to the recent champion releases. Art, design, balance, spell graphics, voice acting—there are so many components that go into each release, and it’s obvious that Riot are pushing themselves with each new character. There’s more than just the surface to look at, however. While the artistic and balance sides of new champion releases are worth applauding (even if it took a while for Taliyah to find her footing on the Rift), what I find most interesting is how Riot’s new champion designs unify their visuals with the fantasy of playing them. In order to fully appreciate some of the modern designs, let’s take a look at two of the original forty champions (both of whom are in sore need of a rework): Kayle and Morgana. Kayle and Morgana both have kits that work and basic visual fantasies that are easily understandable. One is an angel paladin, one is a fallen succubus, and they’re sisters who hate each other. While Kayle and Morgana are both cool characters at first glance, their kits don’t interact with each other. Kayle sits in the backlines and does a bit of healing and protection, but mostly pumps out damage with her E.
Morgana snares and farms with her W. While her shield and ult have given her more modern prominence as a support, they’re both flat characters compared to the modern cast, in both gameplay and theme. Sure, the core ideas of “vengeful angel”, “fallen sister”, and “eternal war” are cool, but they don’t come through in play or execution at all. Jinx sits in the backlines, dancing back and throwing out volleys of carnage while laughing maniacally. The more damage she causes, the easier it is for her to get away thanks to the speed boost on Get Excited! If she performs her role correctly, she should be untouched and a complete menace, and annoying to boot. Vi, on the other hand, desperately wants to catch Jinx and shut her down. She should be charging through the backlines, smashing into Jinx and pummeling her. If the carry manages to evade her Q, it’s time to bring down the long arm of the law and use her ult. In short, their gameplay dynamics are fun, exciting to watch, and directly reflect their relationship in game. Vi and Jinx are a great example, but not every release has gone so smoothly. It’s worth noting that Vi and Jinx share a designer: August “Gypsylord” Browning (Gypsylord has also been behind Gnar, Ekko, and Jhin). Different designers are behind different champions, and each one leaves their mark. There are also multiple other factors that have to be considered during a champion’s design. Like: will this be unique? Part of the recent mid season mage update was to make the mages distinct from one another. Vel’koz, Lux, Xerath, and Ziggs all had significant overlap, and if one was successful in competitive play, it was because it was superior to the other choices. However, they all fulfilled the same role. Future updates and redesigns will be likely keeping this in mind—does a champion have an unique niche that stands out? This is no small task, with such an enormous roster. Plus: are the design and visuals aligned? Shen is a ninja, but he looks like a tank. Katarina has long steel blades but does magic damage. While many of the older cast are likely stuck with these discrepancies (hence Shen’s rework leaving him as a tank, and Katarina’s future rework unlikely to turn her into an AD assassin), it’s important to avoid this with new releases. Ryze’s rework stripped away his steroid ult and gave him a mass teleport. The next champion will be “even crazier”. Taliyah has a long ranged wall that allows her to slide into fights and begin dishing out damage. As Riot works to create thematically appropriate and narratively consistent characters, they’re also going to be stretching the limits of what is possible. Even scrapped abilities, like Taliyah’s ability to destroy an entire piece of terrain for a limited amount of time, could come back for future champions. There will likely be patterns of repetition (three hit combos! Gimmick passives!) as well as champions who come out undertuned or overpowered, and occasionally champions who just need to be re-tuned as the years tick by. However, Riot has clearly put a lot of love into not just their champions, but the very process that builds them up from a basic concept. The end result is that the future remains bright for League. If they can continue to create champions that are fun to play for casuals and exciting to watch in competitive, the League machine can keep chugging along for a long while yet. It’s been a wild ride since those first forty champions, but there’s no disputing Riot has seriously stepped up their game in creating a cohesive offering across the board.